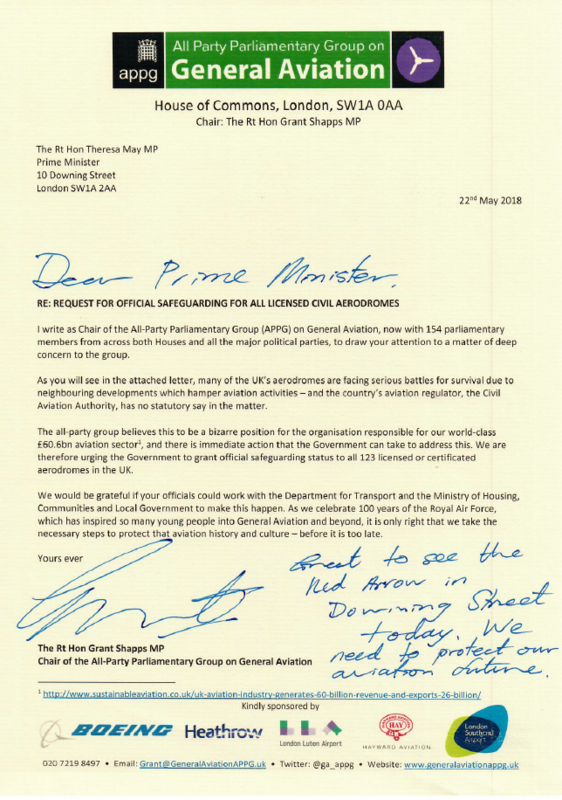 The All-Party Parliamentary Group on General Aviation has called on the Prime Minister and Transport Secretary to grant ‘official safeguarding’ status to all 123 licensed or certificated aerodromes in the United Kingdom. 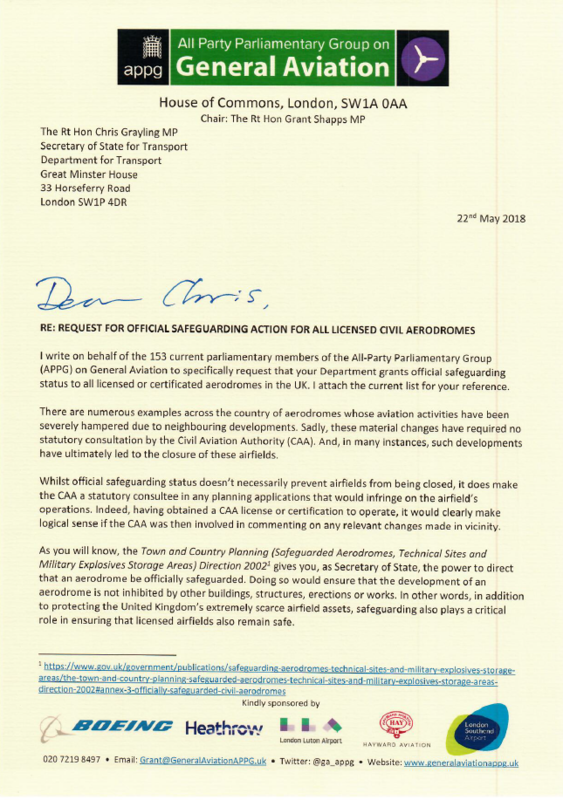 In letters to the Prime Minister Theresa May, and the Secretary of State for Transport Chris Grayling, the 155-strong all-party group warns that “many of the UK’s aerodromes are facing serious battles for survival due to neighbouring developments which hamper aviation activities – and the country’s aviation regulator, the Civil Aviation Authority, has no statutory say in the matter”. This has created a “bizarre position” whereby the organisation responsible for the UK’s £60.6bn aviation sector is not obliged to ensure continued aviation use at many of the country’s airfields. Official safeguarding status is awarded to civil aerodromes by the Government in order to ensure that their operation and development are not inhibited by neighbouring developments such as buildings – which could interfere with navigational aids or distract pilots. This means that any development proposals require consultation with the Civil Aviation Authority. Currently only 29 aerodromes in England and Wales and 12 in Scotland are officially safeguarded. Chair of the all-party group Grant Shapps MP said: “In the year that we celebrate 100 years of the Royal Air Force, it cannot be right that we continue to see our country’s proud aviation heritage extinguished. That’s why we’re calling on Government to take action now to safeguard all licensed airfields in the UK. 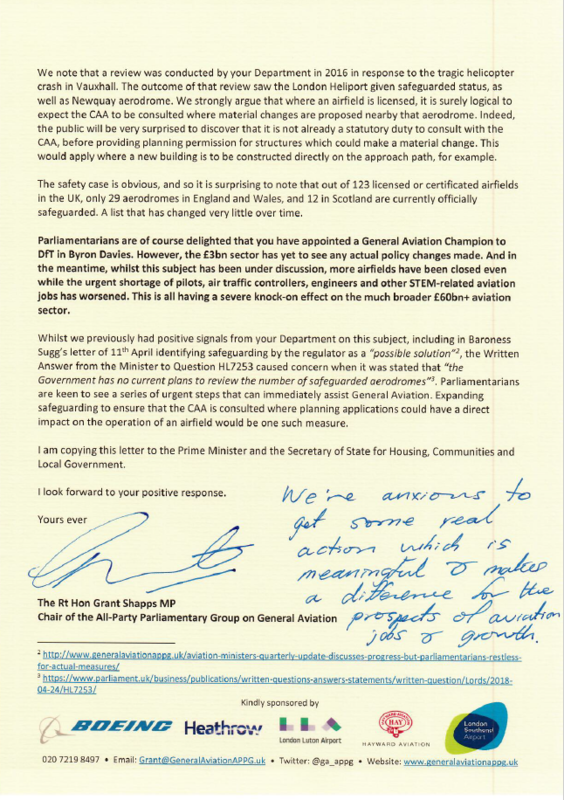 “Whilst we’ve had lots of warm words from the Department for Transport, and the appointment of the first ever General Aviation Champion, the all-party parliamentary group now wants to see positive action from Government before it is too late. The All-Party Parliamentary Group on General Aviation has 155 parliamentary members from across both Houses of Parliament, and all the major political parties. The full membership can be found at www.GeneralAviationAPPG.uk/parliamentary-members. The full letters to the Prime Minister and the Secretary of State for Transport can be read below.